Wind blusters round this shed. 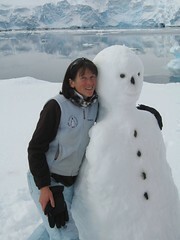 Helen makes a mini snowman. Wind in wrong direction for pee. (Considering the dangers of splash-back is not ideal early in the morning.) Toast, fresh sliced from Helen’s bread is highlight of breakfast! The trouble with not getting dressed and going straight away, is the cold seeps in… Glossed the shop’s kick boards – thought it may take all day, but finish by lunch. Helen sweeps and dusts museum kitchen and touches up magnolia. Tudor sorts through the stationary cupboard, which had accumulated a wealth of oddments. Rick tinkers; helping, fiddling, multi-tasking, but mostly cleaning his drill bits. Oh no! E-mail brings news that the Nordnorge, due tomorrow, will not make a visit – there is still an unmanageable amount of ice in the Gerlache Strait. Disappointing. We were SO ready (and so looking forward to fresh water and clean clothes AND seeing our expedition staff/crew friends again, of course.) News sinks in. I’m shocked somehow. Ok, back to painting and more maintenance opportunities. But we’re ok; enough tins, enough ice. Crack on. More magnolia finishes off the science room. Helen polishes copper snow melter. Sweep. Tidy. Spend an hour typing this onto Rick’s computer, since mine is not responding to charging, nor affectionate patting. Gosh writing about what happened on 27th October is part of our old world. Disheartened for no good reason. Prime moment for exercise. Me and Helen persuade Rick to join us. Tudor’s nose is stuck in Falklands fighter pilot book. Again, a challenge to practice yoga at three degrees Celsius, hard to take socks off. Warm up initially and un-yogically, bouncing around to Basement Jaxx. Spend an hour bending and stretching in narrow spaces on three sides of an old generator! Rick says this room is warm and sun-filled in the summer (the floor is also amuck then with guano from the soles of many passengers feet however…) We are hopeful of motivating each other to continue this regime, knowing how hard that may be when we’re busy. Learn of another cancellation; the ship bringing the Rockhopper film crew has mechanical problems, so they’re not coming just now. What’s going on!?! Ho hum. Tudor dozy, Rick’s dinner delicious. Wind blusters round this shed. Helen makes a mini snowman (without us seeing her) by the kitchen window – several penguins admire it. All unexpectedly weary.